In my much younger days I occasionally took the bus from London to Athens. This day I was sitting up front with the driver as we pushed through hour 19 of the interminable drive through the then still-intact Yugoslavia. Suddenly the driver threw up his arms, breathed in deeply and commanded “miriizii!” (Smell!) “We’re almost home.” It was unmistakable, unavoidable – wild oregano, and soon the Greek border was just down the hill. Woohoo! What a rainbow for your readers today! Most, most understandable that you have to stay away … But hooray, hooray when you come back! Hooray, hooray (hurrah, hurrah?) for the book on its way! Thank you! “Get a grip and call it yellow” sounds like good life/writing advice. Firstly, I would like to say I love “Rachel eats” , I love what you write. I also love “a kitchen in Rome” and would like to know if it is possible to subscribe. Secondly,. I am a new subscriber to “Rachel eats” and found ” a kitchen in Rome” which I also did not know existed and would like to subscribe, is it possible. So glad Rachel to finally be reading your words of wisdom on your blog. It’s the first thing I turn to in Cook every Saturday & have enjoyed reading your first book as well as trying many of your lovely recipes. Great that you’re writing another book – another for the collection! please, tell me, what does “sounding a wally” mean? Being in the USA, I’ve never run across that saying. I tried googling that phrase but there were only 7 choices and your blog was number 1. Great to know you have another book coming out – I’ll watch for it. Oh, Rachel, I’ve missed your blog posts. It helps enormously that there’s your Saturday column in the Guardian every week. But still …. that’s for them, the Great British Public, rather than us, your long term followers. Hope your summer school went really well …. and looking forward to your second book. As I read this, it’s bucketing, or as we used to say, raining cats and dogs. Very atmospheric writing highlighting the verdant green contrast between Dorset and Sicily. Looking forward to the publication of the new book. Bruschetta on a wooden board = Sunday lunch! Why do i have to buy the bloody Guardian app to see these posts?! It wasn’t the missing, more sounding a wally trying to describe it. I was being flippant about writing about food and describing it without sounding a prat! handbag oregano, I love that. I can’t even blame the heat as we’ve had the best summer imaginable so it’s simply laziness that has kept me from cooking. Today I’m going to make pollo alla Romana which seems like a good ratio of work to reward. Or perhaps mañana. I absolutely adore the style of writing. It paints a wonderful picture ! 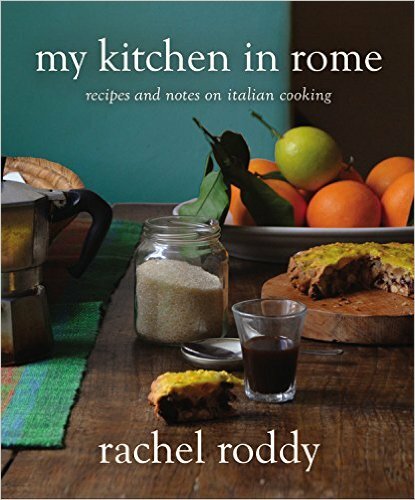 Hi Rachel, I stumbled across your posts a wee while ago and have made many of your recipes (tomato spaghetti being a staple in our house) and have your wonderful book. I am on the way home to Scotland from my honeymoon in Italy and wanted to tell you that we spent our last day wandering around Testaccio and having a wonderful lunch at Flávio Al Velavevodetto. My new husband thought he was humouring me until he tasted the carbonara (plus day 2 of the honeymoon was spent at the Mito Guzzi museum…). Graze Mille for the words and the recipes. I’ve been reading some of your archives, catching up on recipes I’ve missed! Are you coming back, soon?